An expedition that cannot organise itself… on the back of an old envelope, is bound to suffer from the effects of too much organisation. Two Mountains and a River picks up where Mount Everest 1938 left off. In this instalment of adventures, Tilman and two Swiss mountaineers set off for the Gilgit region of the Himalaya with the formidable objective of an attempt on the giant Rakaposhi (25,550 feet). Two Mountains and a River brims with the definitive Tilman qualities—detailed observations and ever-present humour—that convey a strong appreciation of the adventures and mishaps he experiences along the way. 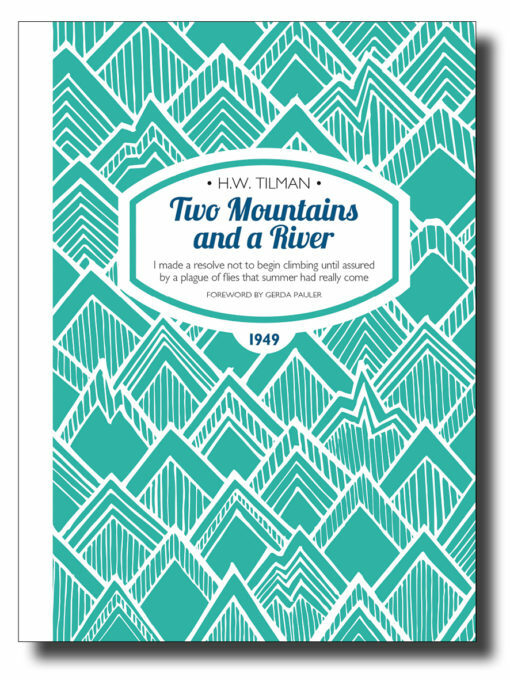 This classic mountaineering text maintains Tilman’s name as a unique and inquisitive explorer and raconteur. Tilman’s vocabulary is wide yet his language is far from being flowery, pompous or overdone. For every single detail or situation he describes he employs the right expression or tone. As a result, Tilman does not get lost in lengthy portrayals of events but takes the reader along his way at a most pleasant pace. Additionally, he shows a high level of knowledge regarding quotes that supplement his narration perfectly without seeking to attract attention by puffiness. Gerda Pauler was born in the late 1950s outside Munich and soon found out that she had ‘inherited’ a liking for adventurous trips from her mother. However, she was almost thirty years old before she set out on her first trip to Nepal, and it was only then that she developed a genuine love for the mountains. Now, about twenty-five years later, she looks back at countless trips to the Himalaya and Central Asia and knows that she will never get tired of visiting the area. Gerda has authored two books on the mountains of Central Asia, Great Himalaya Trail, and Dolpo: People and Landscape. ISBN 978-1-909461-30-7; 216 x 156mm, 256 pages, photos, maps. Softcover with sewn binding, cover flaps and matt lamination.